There are words, and there are pictures. 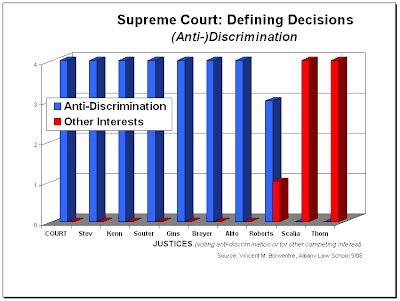 Here is a recap in pictures--okay, graphs--of the previous 2 posts on the New York Court Watcher: the Court's "defining decisions" last term dealing with discrimination and cultural issues. Three graphs. (Click on them for a bigger, better look.) The first depicts the Justices' voting in the 4 discrimination cases discussed in Supreme Court's 2007-08 Term: The Defining Decisions (Part 1: Discrimination) (September 16, 2008). Yep. There's the Court, there's most of the Justices, and then there's Scalia and Thomas. Hey, like it or not, good or bad, that's how they voted. For those 2, some other interest or value was superior to fighting (or seeing) discrimination in each of the cases. 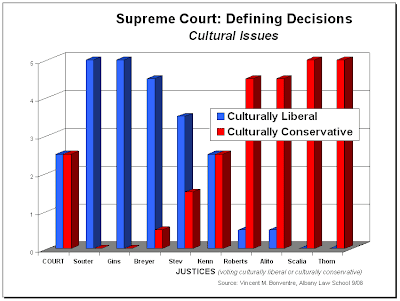 The second graph depicts the Justices' voting in the 5 culturally charged cases discussed in Supreme Court's 2007-08 Term: The Defining Decisions (Part 2: Cultural Issues), (September 20, 2008). You'll see that the Justices are rearranged. In each graph they are ordered from left to right according to their voting records along the liberal-conservative spectrum for the cases involved. A bit different. A few things pop out. The Court--and Kennedy--are half and half in these cases. (Liberal and conservative, that is.) Scalia and Thomas are again at the far right end of the Court, taking the more conservative position in every case. On the other hand, Souter and Ginsburg are the sole occupiers of the liberal-most end of the Court; only they voted on the culturally liberal side in all 5 cases. And, finally, you'll notice some 1/2 votes for some Justices, and 1/2 decisions for the Court. It's about the Baze decision on lethal injections. I thought it most accurate to treat the votes this way. Against lethal injection as liberal (Souter and Ginsburg). For lethal injection, and any other means of execution not like those historically "torturous modes" "deliberately designed to inflict pain," as conservative (Scalia and Thomas). And for lethal injection, but because it was not shown to pose any real risk of severe pain that could reasonably be avoided by some alternative method, as 1/2 liberal and 1/2 conservative (Roberts, Stevens, Kennedy, Breyer, Alito, and the Court itself). 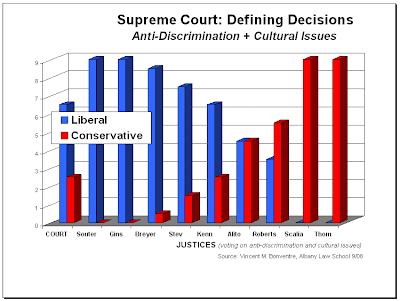 The third graph merely combines the first 2 to get a full picture of the liberal-conservative spectrum based on the Justices' political/ideological/philosophical voting in the discrimination and cultural issues cases together. There it is. That's the Court. At least on these 2 sets of "defining decisions." And that's just about the spectrum that Court watchers have been observing generally--take or leave some votes here and there. Certainly the ideological ends and sides of the Court are exactly what would be expected. And moderate-swing vote Kennedy right in the middle. Not bad for 9 cases. Now a mere 9 decisions--4 on discrimination and 5 on cultural issues--may seem a bit thin to be deemed "defining." But just think of this. A coin is flipped 9 times. Every time it's heads. Wouldn't you be a bit skeptical? You think the coin just might be biased? At least a bit? Well the odds of 9 out of 9 heads actually happening randomly are 1 in 512. A probability of .5 to the 9th power, or .0019. Now THAT's what's pretty thin. So just say a Supreme Court Justice happened to vote "heads" in every one of 9 difficult, ideologically/politically charged, "reasonable people could disagree" cases. You think that Justice, like the coin, just might be biased? Let's be delicate and call the Justice "philosophically predisposed." And a Justice with a more even voting record, is probably less predisposed--at least along the same political/ideological/philosophical lines. ..............And that, of course, is why it's so important who's elected President and what sort of Justice(s) he's likely to appoint. Tne next "defining decisions" post will look at "law and order" cases.